This has nothing … and everything … to do with swimming. 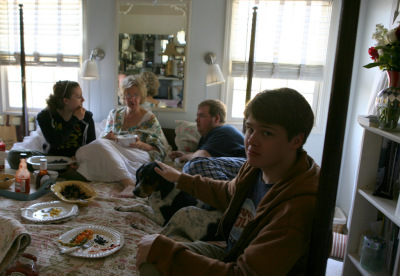 The tradition of breakfast in bed is a nice one. Blueberries and cream, asparagus omelette and fried potatoes with rosemary. Every Mother’s Day they all whip up this frenzy and then we hang out in bed. Complete with dogs and cats. One of the things you learn from being a swimmer is that you can do anything. Once you know that you can get up consistently at 5AM for years, once you know that you can swim faster than the guy in the lane next to you and once you know that you can swim 24 miles straight … you know that you can DO anything. And you know that you can BE anything. So Happy Mother’s Day, My Bionic Boyfriend. You are as much a mother as you are a father. You do homework and cook and build and create and tell stories late into the night. When the kids were little you could change a diaper with one hand tied behind your back. And, on this morning, you made an omelette that knocked my socks off. Enough of the Swimming Tee Shirts!